In years gone past, whether out of necessity or love, treasured dolls were handcrafted and finished with hair clippings from a child or family member. When the art of doll making was left to modern industry, keepsakes such as hair clippings were simply preserved in scrap books or put away and all but forgotten. Precious Keepsake was established in the hopes of restoring some of that original tradition and providing everlasting treasures that could be displayed and cherished. Precious Keepsake creates a lifetime memory by hand crafting a porcelain doll to your specifications, and finished with hair clippings from your family member. 16 - 18 inches tall. A picture or other interesting facts of family member. 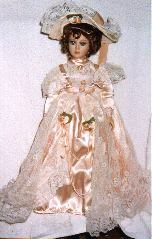 Each doll takes approximately 4 weeks to handcraft after receipt of the hair. The order must be paid in full prior to shipping. The clippings should be at least 5 inches in length and approximately a nickel in diameter to ensure proper coverage without additional fill and should be mailed in a zip lock bag.